If you are a blogger that has Adsense or any other foreign Affiliate programs, you most times required to provide TIN/EIN/SSN/ITIN for your tax form. The Tax Identification Number (TIN) is used by United States' government to track the amount each of their citizens earn monthly and how much they will pay as tax. But if you are not a US citizen but earn or have a US based business like Google Adsense, you will need to get a valid TIN/EIN which is very difficult to acquire as a non-US citizen. This tutorial article guides you on the step by step guide to fill and submit the tax form using a virtual TIN/EIN/SSN/ITIN which will be issued to you instantly. There are other methods to obtain a TIN, but they are too stressful and requires many protocols. The virtual TIN method explained in this tutorial article works for any country so you don’t need to bother for other methods mentioned below which are stressful for any non US citizen. Application Through Fax: For this method, you are required to downloads and submit a completed SS-4 form via fax through their official fax number and also involves other protocols which may take up to weeks. Application Through Mail: For this method, you will have to send a completed SS-4 form through mail. And it takes weeks to months before you can get a response or mail from Google adsense if at you are eligible. Application Through Telephone Call: This method seems easier than the other methods. Although you can get your TIN instantly, but the number is not toll free, the call charge for the international call is too high. 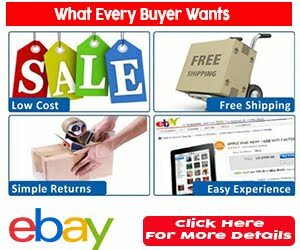 also you need to stress your ear in order to hear and understand the questions you are being asked by the google Adsense cutomer agent. To obtain your TIN or EIN, you can call the adsense agent on 267-941-1099, available from 6:00 a.m. to 11:00 p.m. (Eastern Time), Monday through Friday (working days). Now let me go back to the main aim of this tutorial article! 1. 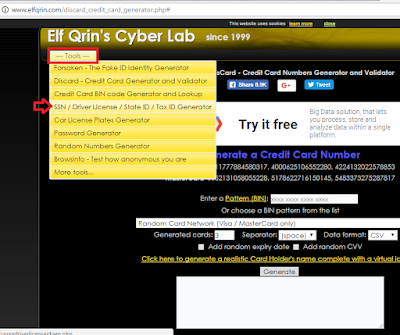 Visit Elf Qrin's Cyber Lab at www.elfqrin.com. The details generated from this website are not real details, but you can use them in many cases, but not all. The risk and consequences are all yours. I just provided this article to help you. 2. Then Click on Tools. Then click on the sub-menu that best describes the virtual detail you want to generate. 3. 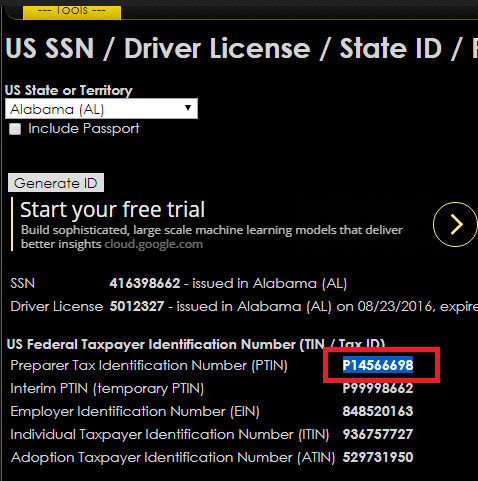 For The Filling Of Your Google Adsense Tax Form: You will click on SSN / Drivers License / Tax ID Generator as shown in the screenshot below. 4. Next, select a valid US state from the US State or Territory drop down menu. click on Generate ID. The website will generate a virtual SSN, Driver License, PTIN, temporary PTIN, EIN, ITIN, ATIN. Copy the generated Preparer Tax Identification Number (PTIN) as shown in the screenshot below. 5. Next, go over to your Google Adsense W-8 BEN Tax Form (click this link) and paste the copied PTIN. You can also copy the generated virtual details, paste and save them to a safe location on your computer for future use. 6. The same applies to generating any other virtual detail from the website. 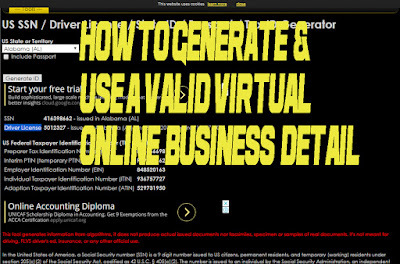 I have clearly explained how you can generate any virtual detail like SSN, Driver License, PTIN, temporary PTIN, EIN, ITIN, ATIN, etc. 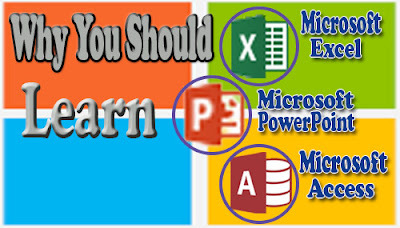 for your business. 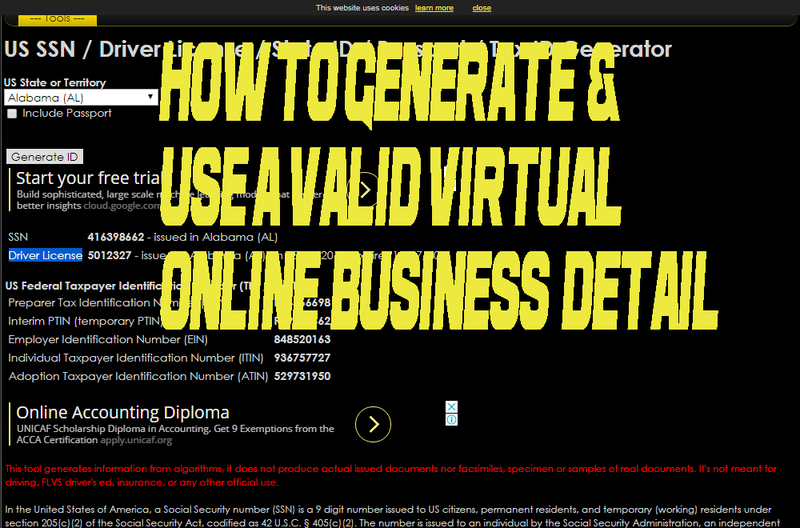 I know you have some suggestions and questions on how to generate these valid virtual info for your business. I will be glad to hear it in the comment section below.